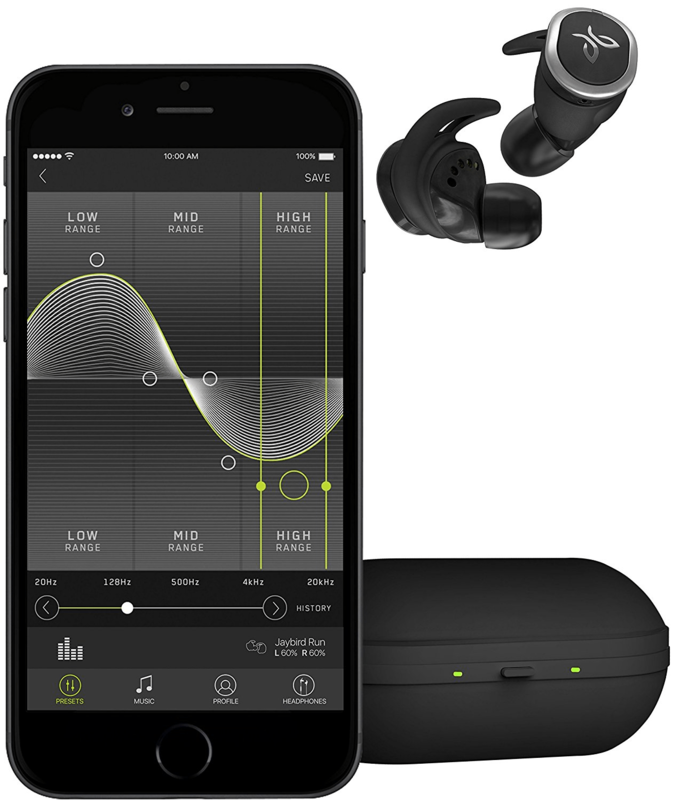 Jaybird has been in the headphones game for eons, during which they’ve built up a devoted following. After spending time with the Jaybird Run Bluetooth Earbuds, I can see why. Since Logitech bought them last year, all things Jaybird related went a bit quiet in New Zealand. Because of this, I leapt at the chance to review their latest ear gear, the Jaybird Run Bluetooth Earbuds. They’re not half bad, but (there’s always a ‘but’) do they have what it takes to compete against the likes of Samsung and Apple? Like the old saying goes, ‘there’s only so many ways to skin a cat’ and that’s the case design-wise with the Jaybird Runs. They’re a lot like Samsung’s Gear 3, which speaks volumes about the wisdom of sticking with a design that works. Apple chose not to with the Airpods, which makes the wearer look like they’ve stuffed golf tees in their noggins. 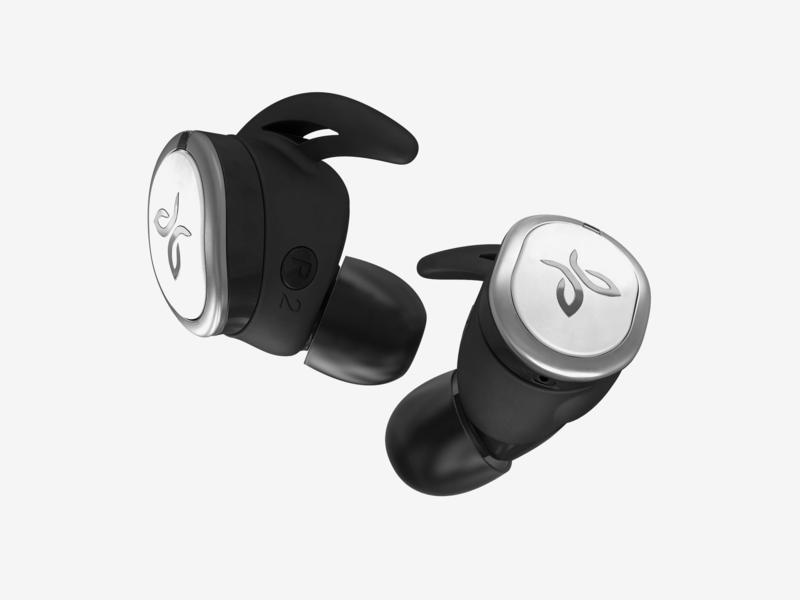 Looks aside, the Jaybird Runs are a good fit and never felt like they were going to pop out. They’re crafted out of black plastic with silver accents. There’s also an alloy logo that does double duty as a Bluetooth antenna. Plonking them in my ears, they were a snug but comfy fit. As no two ears are the same, Logitech bundle different tips to ensure a good fit. Then there’s the charging case. It looks like a miniature small Beats Pill speaker. There’s LEDs on the front so you know the charge status of both left and right earbuds. It also made pairing effortless. Opening the case for the first time put them into pairing mode. This allowed me to get them paired to my phone without shagging about looking for a pairing mode button. From then on getting them connected was as easy as opening their case. It’s seamless and wins jaybird brownie points. I’m a fan of anything that saves me from fiddling with Bluetooth settings while racing to catch a bus/train/plane. Taking Bluetooth cans for a stroll in Wellington’s CBD is an excellent test of their connectivity as the CBD is awash with RF interference. While there were connection dropouts in the middle of several songs, they worked flawlessly at home. Their controls are simple, customisable and frustrating. Using the Jaybird mobile app, I could swap from default controls to a custom config. With either setting you can also double tap the bud buttons to skip songs or skip backwards, but the Jaybird bud buttons required a serious push. This saw me pushing the earbud deeper into my ear, which was both uncomfortable and annoying. The Jaybird mobile app (IOS/Android) gets the thumbs-up. It provides both customisable and pre-set equaliser tweaks. These helped wring every bit of ear-pleasing goodness out of the buds. Given their small size, and my ability to misplace things, I often used the app’s ‘find my earphones’ feature. Their marketing bumf says four hours of playback is the norm. I got 3 hours and 50 minutes. Their carry case also doubles as a charging case. This meant I was able to take the Jaybird Runs from a near zero charge to full twice before I had to charge the carry case. What impressed was the use of fast charging. This equates to five minutes of charging giving me an hour listening. 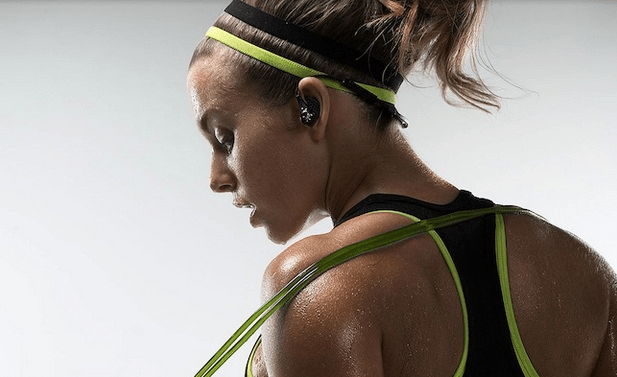 The audio of Bluetooth earbuds is often not flash. The Jaybirds proved to be an exception to this rule. They also have the added advantage of equalisation via the Jaybird app, which allowed them to deliver solid audio. Yes, you will get more nuanced and detailed audio out of a pair of wired ear-buds, but the freedom and convenience of going cable commando makes up for this. A lot of earbuds (wired and wireless) often lack anything approximating bass. The Jaybird Runs did a solid line in Oonst. All told, their audio sounded a lot like something you’d expect from a pair of over ear cans. There’s a lot to like with the Jaybird Runs. Their build is excellent. The fast charging feature is useful beyond measure. Going for a run or working out at the gym sees their lack of cable clutter being hard to beat. They may not outgun audiophile grade ear gear, but they’re not too shabby at all. About the only drawback I found with them involved their stiff buttons. Otherwise, they offer excellent bang for your buck.